WE BEGAN THIS JOURNEY NEARLY 30 YEARS AGO, IN THE SAME PLACES WE FIND OURSELVES NOW.. In the late 80's we started a snowboard brand called Twist, one of the first brands in a tiny industry. We taught ourselves how to make clothing, initially learning how to screen print tee shirts in high school, then making patterns and garments in college on our dorm room floor. The brand exploded and led us on a journey of making thousands of outerwear pieces per year. Initially contracting our sewing in Denver, then expanding to Los Angeles, and finally producing in Italy, Thailand, and China. Following this trial-by-fire, we worked for some of the world's greatest brands, designing and manufacturing up to one million garments per year. Four years ago we brought the company full-circle, with a tight focus on USA manufacturing. Now we are producing in the same great places where we started; Denver, Los Angeles, Chicago, New Jersey. There are hundreds of thousands of garments being cut and sewn in America every week, with 45,000 garment industry workers in LA alone. All of the fabrics, trims, and services are here, and we have found the best producers for our customers. We focus in two main areas, Corporate Branding / Premium Promotional goods and Branded Cut and Sew. CORPORATE BRANDING / PREMIUM PROMOTIONAL: In our Corporate Branding division we help consumer brands and marketing firms create exceptional apparel and accessories for their staff, key customers and events promotion. We utilize a combination of stock suppliers (tees, sweats, hats) and custom cut/sew, with an eye towards ensuring that the quality and design of the promotional items are equal to the quality of the brand these items represent. 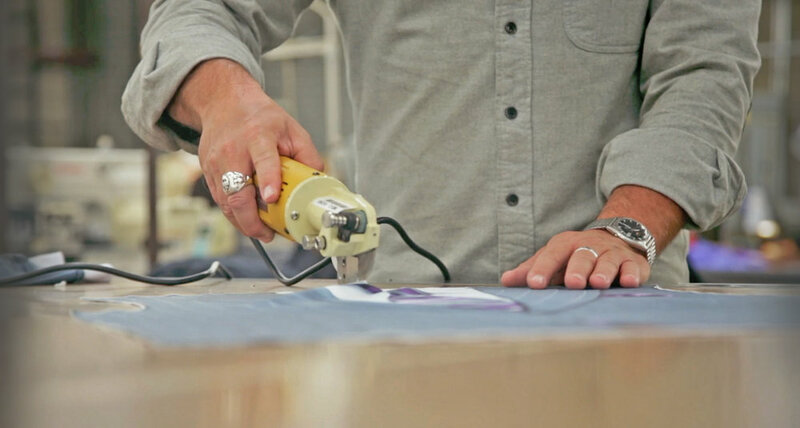 BRANDED CUT AND SEW: Having spent so many years producing apparel offshore, we have an intimate understanding of the process and language of bulk manufacturing. Most American brands have offshored their merchandising and development staff, so the concept of domestic manufacturing can be daunting. In offshore manufacturing a brand sends a tech pack to the factory or agent in Asia and all of the processes in making a first sample are managed by the factory. The factory makes the pattern, the development sample, source zippers, thread, labels, snaps and other trims, source (or purchase from a nominated vendor) all fabrics, linings, insulation. And finally FedEx a first sample to the brand for review. In US manufacturing, all of these sources and services exist but none under the same roof. WE MIRROR THE OFFSHORE PROCESS, a brand sends us the tech pack and we manage all sourcing and services, sending the brand the first prototype via FedEx. BULK PRODUCTION IS MANAGED IN THE SAME FASHION, THE BRAND OPENS THE PO TO NATIONMADE AND WE DELIVER THE COMPLETED GOODS. WHAT SETS NATIONMADE APART FROM OTHER BRANDING/PRODUCTION AGENCIES: We bring world-class design and merchandising to the equation. We have designed or produced over $1 billion in retail value over the past 30 years, and will bring this experience to your project. Our domestic fabric and trim sourcing is second-to-none, we can execute any type of print, helping to build your files for perfect duplication. Our pattern and proto team will ensure a perfect fit for your design. For brands who want to use their Asian fabric sources for domestic production, we will work with your nominated suppliers to bring the goods through the Long Beach port, ensuring smooth customs clearance and quick-turn production. We believe that any American brand can produce 10% of their apparel in the USA without sacrificing quality or margin. For some brands it means moving their tees, sweats or athlesure pieces to America. For others it is jeans, workwear, or accessories. Imagine if Nike, Under Armour, Patagonia, Burton, The North Face and the other top 20 brands would move 10% back to the USA. This would mean millions of garments and billions of dollars every year. Our mission is to help create the support structure for these brands to start the process of returning 10% IN 10 YEARS! Contact us at 303-883-9563 or Troy@Nationmade.us to get started on your next project!